The partition of Dachikan Village of Doumen Town resulted in the year 1457 formation of Nanmen Village. Located west of Huangyang Mt and east of the Hutiaomen Watercourse south section, the 2.7-sq-km (1-sq-mile) village was founded in the first reigning year of the Tianshun Emperor of the Ming Dynasty (1368-1644). The Chao (Zhao) Clan, accounting for 95 percent of the village population, had relocated from Jiangxi's Poyang to Dachikan in 1234, the first reigning year of Emperor Lizong (1205-64). Lizong, personal name Zhao Yun, was the 14th emperor of the Song Dynasty (960-1279) and fifth emperor of the Southern Song (1127-1279). Zhao Long was of the 15th generation of Kuangmei -- second younger brother of Song founder Chao K'uang-yin (Zhao Kuangyin). He founded the village with the name of Nanmen around six centuries ago when he relocated to Doumen from today's Shiqi of Zhongshan. 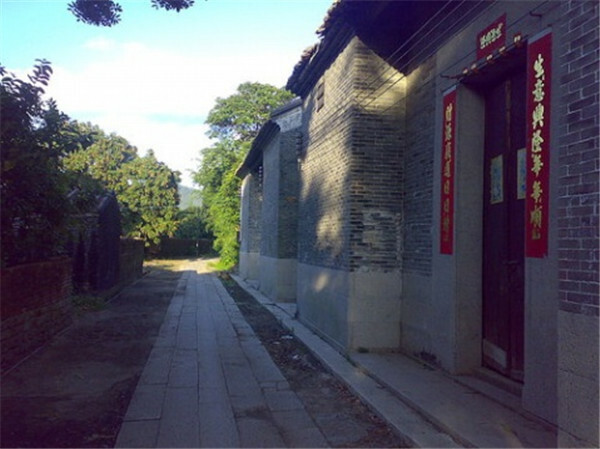 Lvyi Ancestral Hall was built in memory of Zhao Meinan, styled Lvyi, a poet and ideologist in the Yuan Dynasty (1279-1368). He is the ancestor most worshiped by the Zhao Clan. 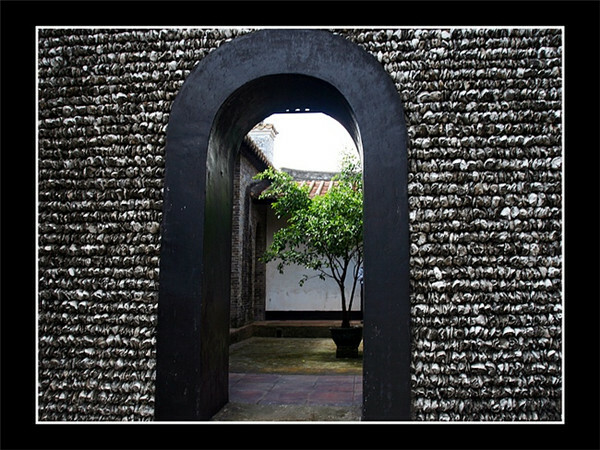 Covering 408 sqm (4,382 sq ft), the hall is noted for three exterior walls 65 cm (25.6 in) thick and constructed of large and firm oyster shells. With gambrel-roofed gable walls and boat-shaped roof ridge for the main structure, the building features abundance of wood carvings, and stone, brick and clay sculptures. The stylobate and pedestal are in Ming architectural style. A monument to offspring of the Zhao royal family in Doumen, Lvyi Ancestral Hall is significant in the study of southward migration of northerners along with their culture during the Southern Song. Ninth-generation ancestor Zhao Yifeng (1485-1563) is memorialized in Zhao Yifeng Shrine. 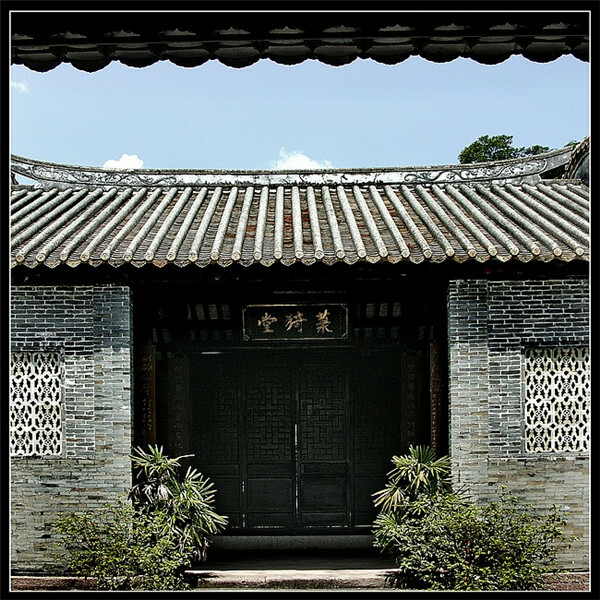 It was first made of oyster shells in the late Qing Dynasty and rebuilt in gray bricks in 1928. It covers 506.5 sq m (5,457 sq ft) with the main structure adorned with stone, wood, and brick sculptures, frescos and green-glazed tiles. Built in 1893 in the Qing Dynasty, Zhao Kunshan Shrine commemorates 9th-generation ancestor Zhao Kunshan (1469-1558). Covering 710 sq m (7,642 sq ft), the shrine features gray-brick walls and wood. It was bombed by air when it served as Zhongshan County Hall during the War of Resistance Against Japanese Aggression. The shrine was reconstructed in 1949. The architectural cluster also encompasses the 166.4-sq-m (1,787 sq-ft) Zhao Yitang Shrine, built in mid-Qing Dynasty in memory of Zhao Yifeng's eldest son Zhao Yitang and restored in 1928; the 409.46-sq-m (4,402-sq-ft) Zhao Yixiang Shrine, built during 1820 to 1850 and reconstructed in 1915 in memory of Zhao Yifeng's second son, Zhao Yixiang, and is also called Dun Hou Tang (Hall of Honesty & Sincerity). Zhao Weimao, a royal descendant of the Southern Song, built Jiexia Manor after he made a fortune in trading traditional Chinese medicine. The manors here used to house the Zhao Clan, the most thriving family in the village. The estate had 14 houses of gray bricks and black roofs, the 1,000-sq-m (10,764-sq-ft) Chongji Hall with 72 doors, as well as art and martial arts halls, stables, gardener lodges, gardens, an 880-sq-m (9,472-sq-ft) lotus pond with pavilion and colored stone boat, zigzag stone bridge, and 4.3-m (14-ft) wide bridle path 13.2 m long. Moreover, a moat with dense sharpened irons on the bottom was built in the late Qing Dynasty to protect against attacks. The moat was reconstructed two years ago. With a pleasant environment and suitable facilities after recent renovations, the manor presents a welcoming feeling for visitors interested in antiquity. Several TV series have been filmed there. Since establishment of Song Dynasty, the Imperial Kinsmen Sacrificial Rites have spread from the Central Plains to Dachikan and Nanmen and neighboring areas over the past thousand years. Zhao Clan people use the rites to pay respect to ancestors at Chinese New Year and on other major occasions at family shrines. 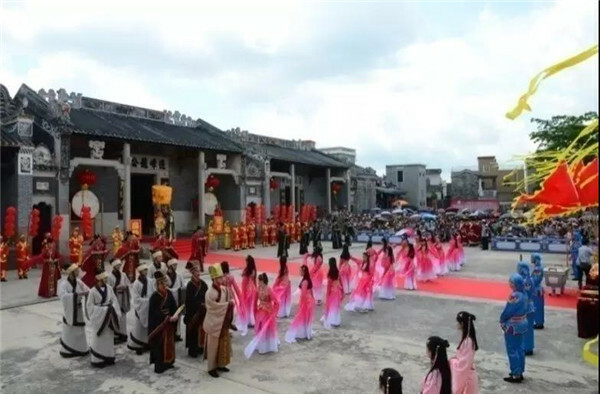 The ancestor-worshipping celebration, known as Imperial Kinsmen Sacrificial Rites, was designated a Guangdong Provincial intangible cultural heritage item in 2016. Nanmen was designated a first-group China Rural Tourism Model Village by the China National Tourism Administration in September 2015. It is also one of the Top 10 Beautiful Villages in China.